Microsoft Outlook Express (OE) is end-of-life and replaced by Windows Mail Live (WML). Moreover, Outlook Express version 6 was bundled with Internet Explorer and could not be (re-)installed as a standalone application. Hence, the need to say goodbye to this Mail Client and welcome the new version, renamed to Windows Live Mail. This freeware Mail Client can be downloaded from the Microsoft Download Center. Follow the steps explained in my ‘Microsoft Outlook Express – Housekeeping’ post. Indeed, install Windows Live Mail first on your ‘old’ system to migrate the messages. Once Windows Live Mail is installed, you can import the OE folders and export them into a WML format. The conversion of these data is worthwhile, since WML will create a single file for each message. 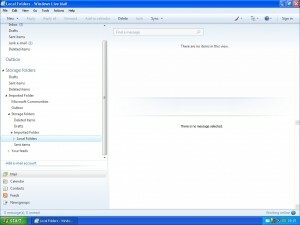 Install Windows Live Mail on your ‘new’ system. Import the Outlook Express internet account files (‘.aif’ file) and address book (‘.wab’ file). Now you’re done and your new system uses the new Microsoft Mail Client, with your mail account(s) and access to your (old) messages and address book. Posted by bioss at 10:41 pm on January 11th, 2010.